The Furniture Classics 21-15 Deluca Arm Chair is available in Hickory Park's, North Carolina Furniture Galleries. Hickory Park may be restricted from showing prices, however please select the Click For Quote button and Hickory Park Sales and Design Staff will reply or please call (828) 322-4440 for more information. 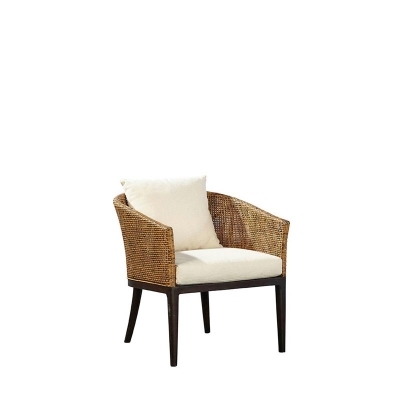 This charming tub chair features a solid mahogany frame with a rubbed black finish The caned back and sides are in honey tones and add a nice punch to this simple and stylish chair A soft cream fabric covers the loose back and seat cushion. Click here to receive price quote for Arm Chair 21-15 item.